"This is a pillowcase with built-in cooling gel technology that adds soothing comfort to any pillow. The gel lining zips in and out for easy cleaning of the outer cover. Available in standard, queen and king sizes. - Cooling Comfort. Hydraluxe gel technology keeps you cooler longer. - Refreshing gel. 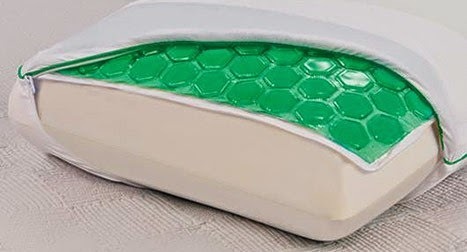 Converts any pillow into a refreshing gel cooling pillow. - Breathable mesh cover with elegant trim. Supple, super-soft and machine washable. - Affordable comfort. Standard size pillowcase: $19.99. Queen size: $29.99. King size: $39.99. - Free shipping at ComfortRevolution.com! The advanced gel technology stays cool to the touch to aid in total muscle relaxation. A revolution in cool, our Hydraluxe gel sleeps cooler, so you fall asleep faster and wake refreshed." This pillowcase is cool to the touch. If you get warm, you can just roll over and the other side will be cool. It is pretty comfortable, and if you are a side sleeper, it can help maintain a comfortable body temperture for a better night's sleep. ABCD Diaries gives the Hydraluxe® Cool Case by Comfort Revolution an A! Visit Comfort Revolution to find the perfect cool case for your pillow!